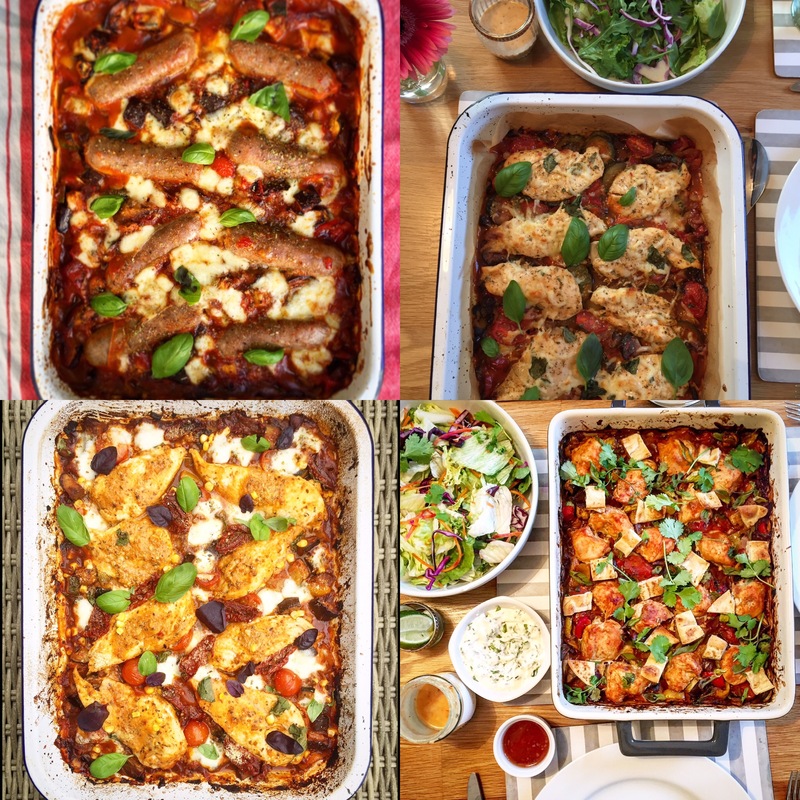 If you follow me on Instagram you’ll have noticed that I’m rather partial to this traybake style of cooking, especially during the week. 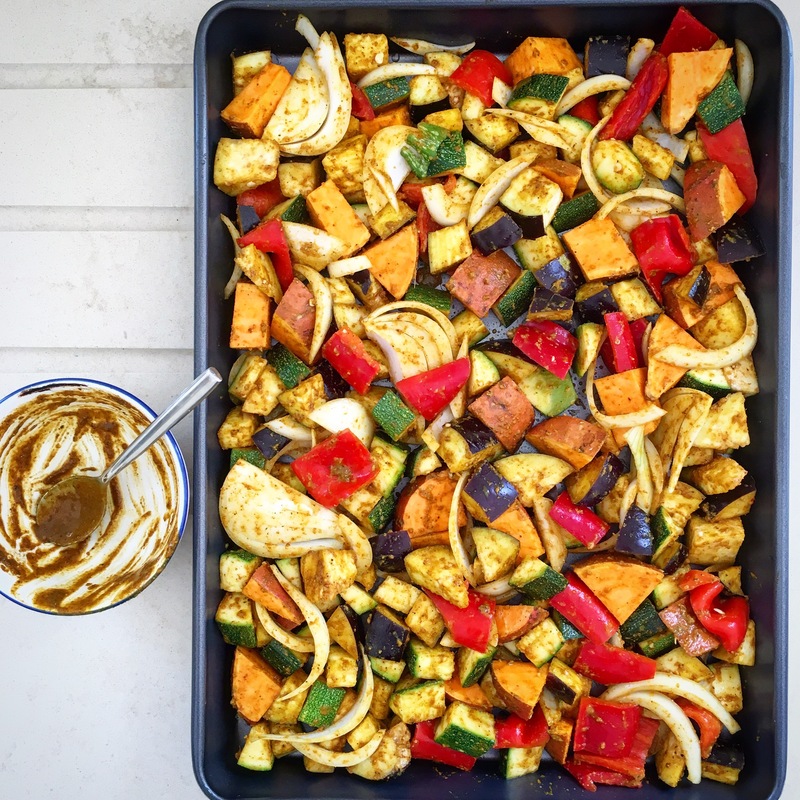 Not only does cooking everything together on one tray really cut down on the washing up (of which i’m not a fan, who is) but I love that all the vegetables really soak up the flavours of the dish. 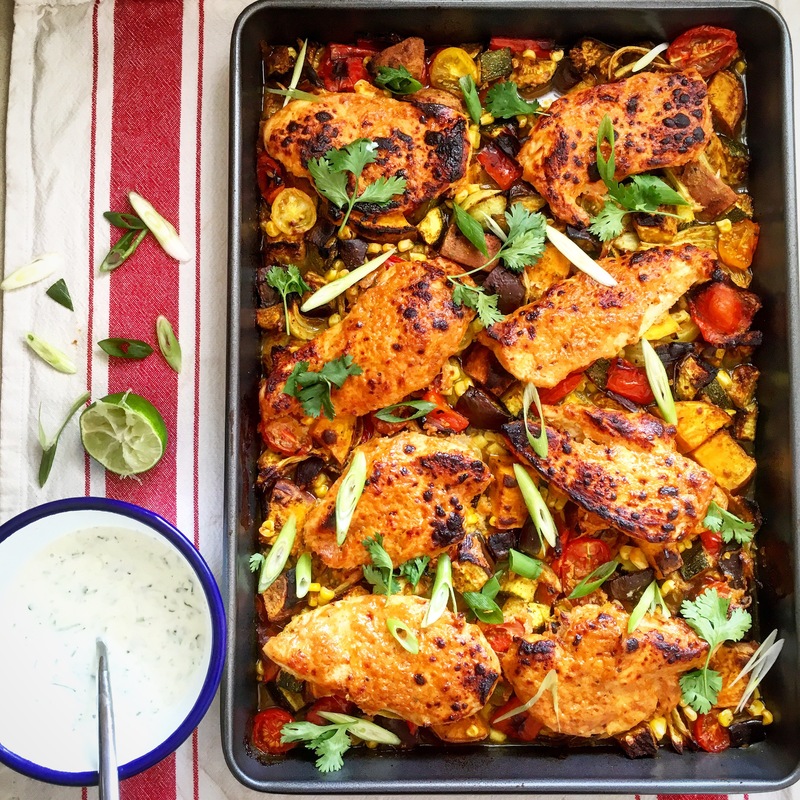 Dinner can be ready from start to finish in an hour without having to clean the hob; which for such a delicious, healthy meal isn’t bad really is it? 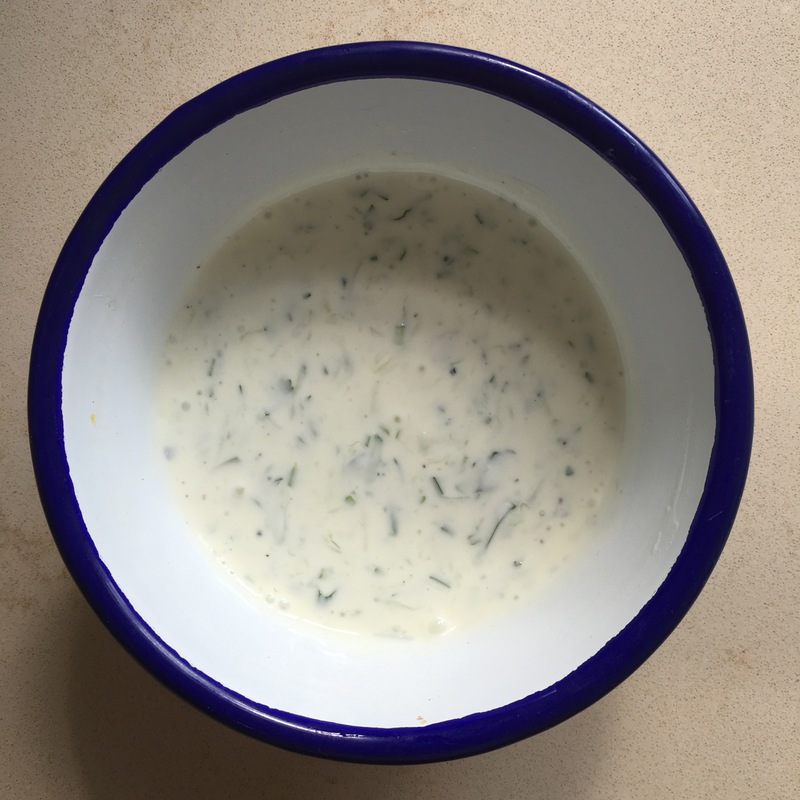 I often use yogurt as a marinade for chicken, it helps to tenderise, keeps it lovely and moist and also adds a delicious flavour too. It’s widely used in Indian, Turkish, Greek and North African cooking mixed with spices. 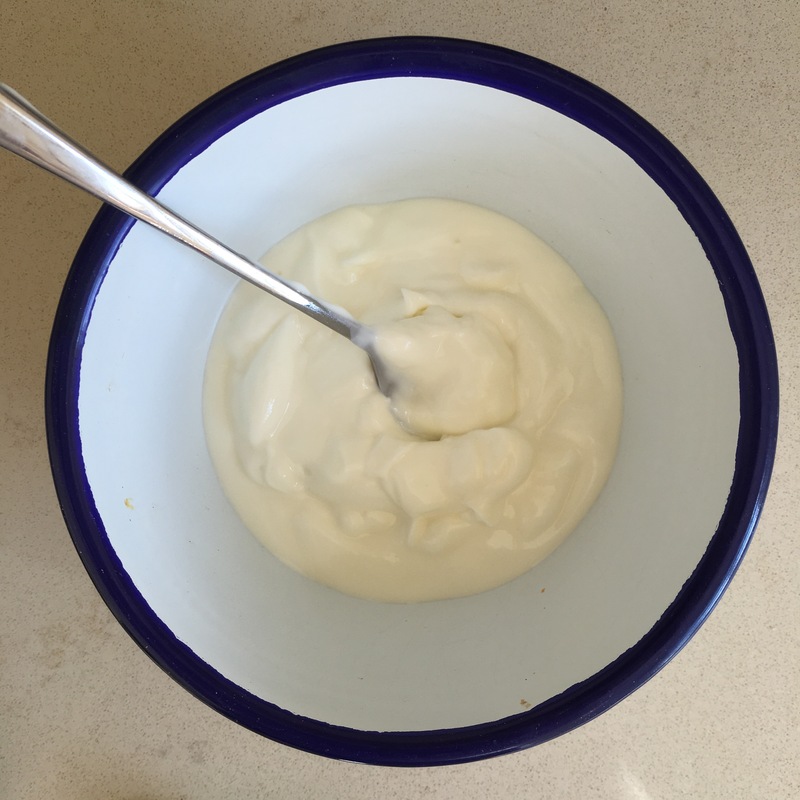 Like hot oil, the yogurt helps the spices to ‘bloom’ and release their aromatics and flavour, so it’s great for getting the flavour out of spices without adding lots of extra fat. Yogurt also contains probiotics, the good bacteria that help our digestive system, which are thought to be essential for maintaining good health. Yogurt has been found to help the body burn fat, is full of B vitamins and can also help prevent high blood pressure. Not only this but recent research into the area of mental health suggests that probiotics may actually improve our mood as too! A study carried out at the Leiden Institute of Brain and Cognition at Leiden University, found that those who took a probiotic supplement were more able to overcome sad moods and thus had fewer depressive thoughts and bouts of sadness than those who hadn’t taken the supplement. 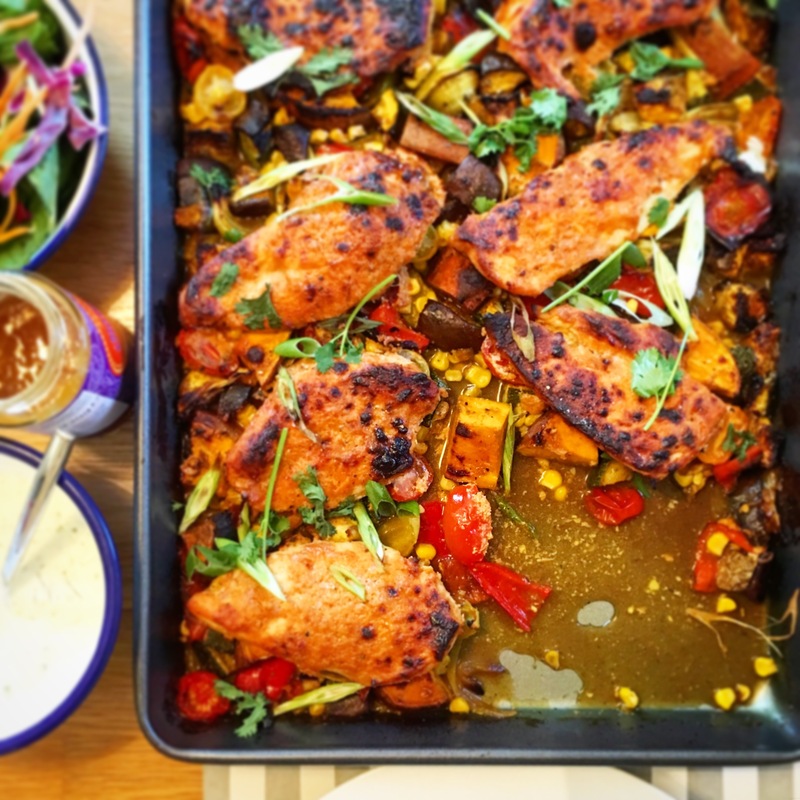 If that’s not enough reasons to convince you to make this chicken tray-bake then here’s a few more for you. It’s full of a rainbow of vegetables. You have probably seen the hashtag EatARainbow on Instagram, and despite being a trendy phrase it’s actually very important. Advice recommends that we should be eating a wide variety of fruits and vegetables. Fruit and veg fall into 5 different colour categories; each one carries its own set of phytochemicals that help to combat disease in our bodies. Eating just one colour, say your greens, will not provide you with the wide variety of nutrients that your body and mind needs. Red, provided by the tomatoes and peppers in this recipe are coloured by a natural plant pigment called lycopene. This antioxidant has numerous health benefits, the most important being its cancer fighting properties. 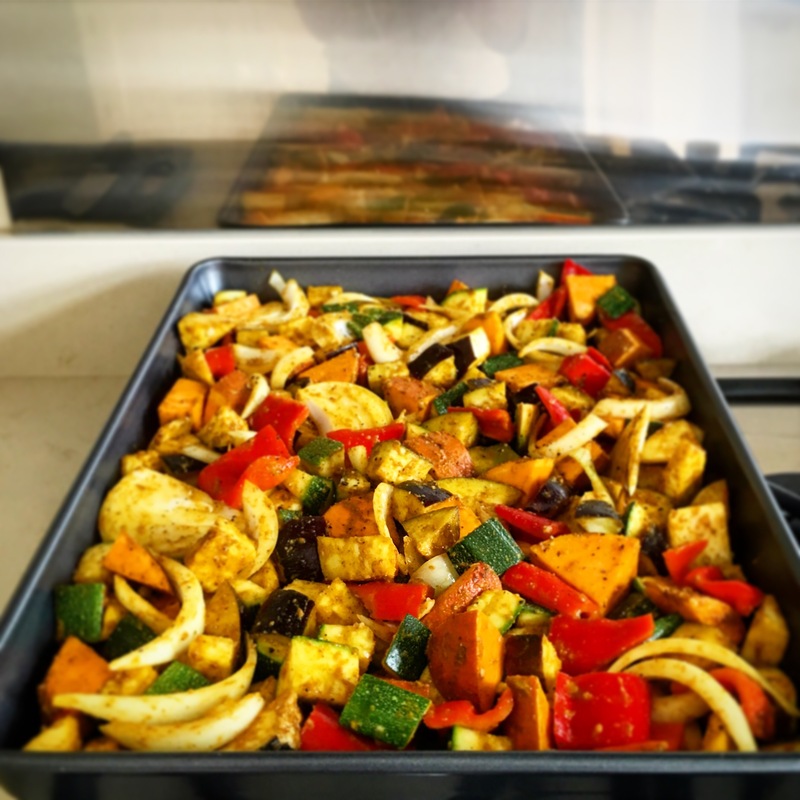 Orange or yellow, provide by the sweet potato and corn in this recipe contain carotenoids, such as Beta-carotene, that are very important as they help to keep our eyes healthy and can prevent or reduce age related degeneration! Purple or Blue, provided by the aubergines in this recipe contain anthocyanin, a really important pigment which helps to protect our cells from damage. Greens, provided by the lime, courgette, spring onions and cucumber, contain a range of phytochemicals. As they contain such a wide range it’s really beneficial to include some greens with all of your main meals, that’s why I often serve greens on the side of my meals. Try sautéing with a little garlic and chilli to make them tastier. Brown and white, found in the onions and garlic in this recipe contain allicin which has antiviral and antibacterial properties, as well as adding lots of flavour too. The final reason? 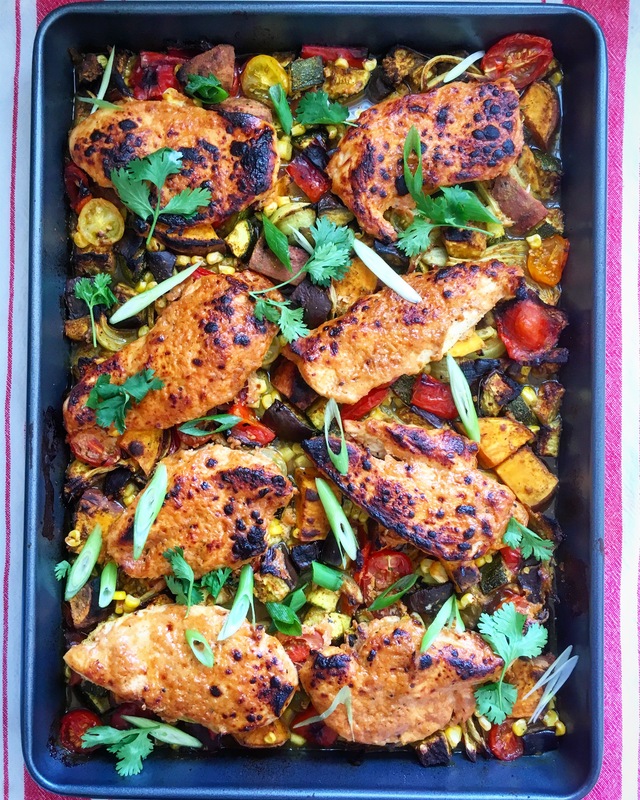 This really is a delicious recipe, it’s full of flavour and the leftovers work really well for lunch the next day too, in fact it tastes better the next day after all of the flavours have developed. It’s all cooked in one large roasting tray too so there’s hardly any washing up, perfect for a weeknight meal. So now you really have no excuse not to make this, remember to share the recipe if you do using the hashtag BakingYouBetter. Happy cooking. First marinate the chicken, if you have time do this the night before and leave in the fridge overnight. Mix all the marinade ingredients together with some salt and pepper and add the chicken, mix to coat. Heat oven to 220C/200C fan/gas 8. Take a really large deep baking tray or roasting tin and lightly oil. 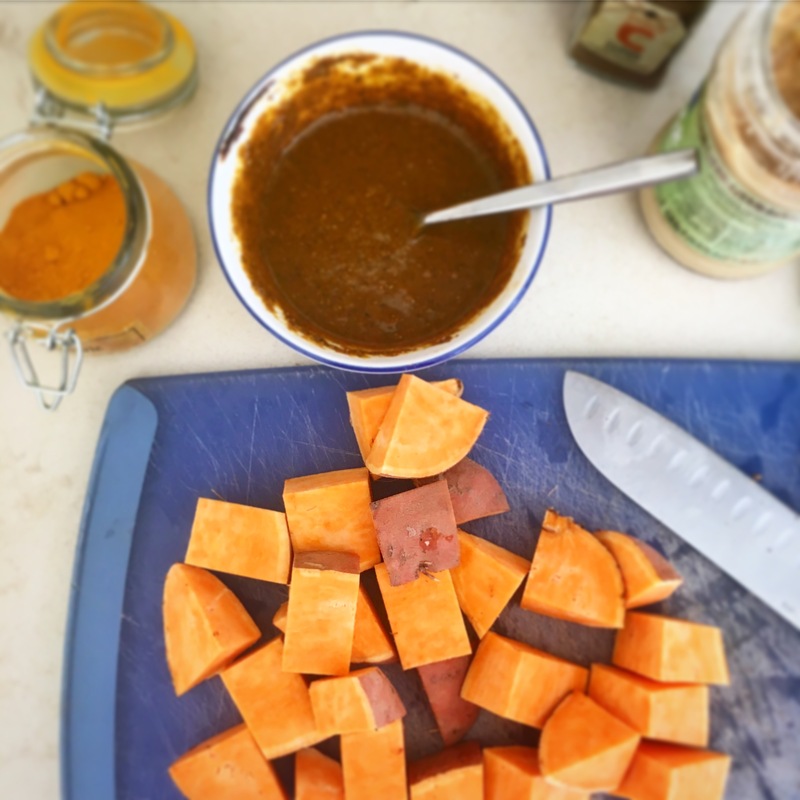 Make a paste by mixing the curry power, ground spices, mango chutney and garlic & ginger puree with 1 tbsp of water and a large pinch of salt and pepper. In a large bowl toss together the veg (apart from the tomatoes) with the spice paste, mix until everything is coated. Arrange on the tray in an even layer, roast for 35 minutes. Remove and stir the veg and then pour over the stock, corn and the tomatoes. 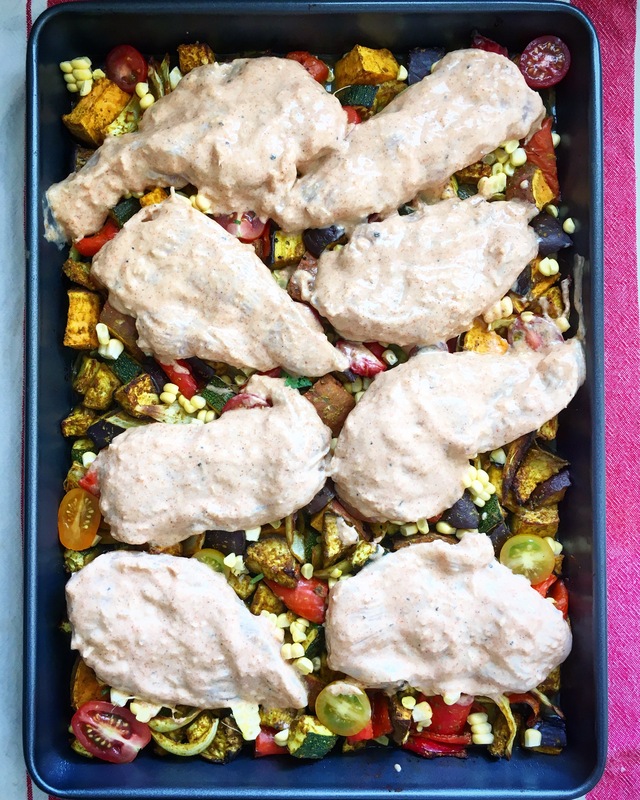 Arrange the chicken on top, shaking off any excess marinade. Roast for 15 minutes, then turn the oven to the grill setting (or place under a hot grill) and once the girl is hot cook for 10-12 minutes, until the chicken is lovely and charred on top. 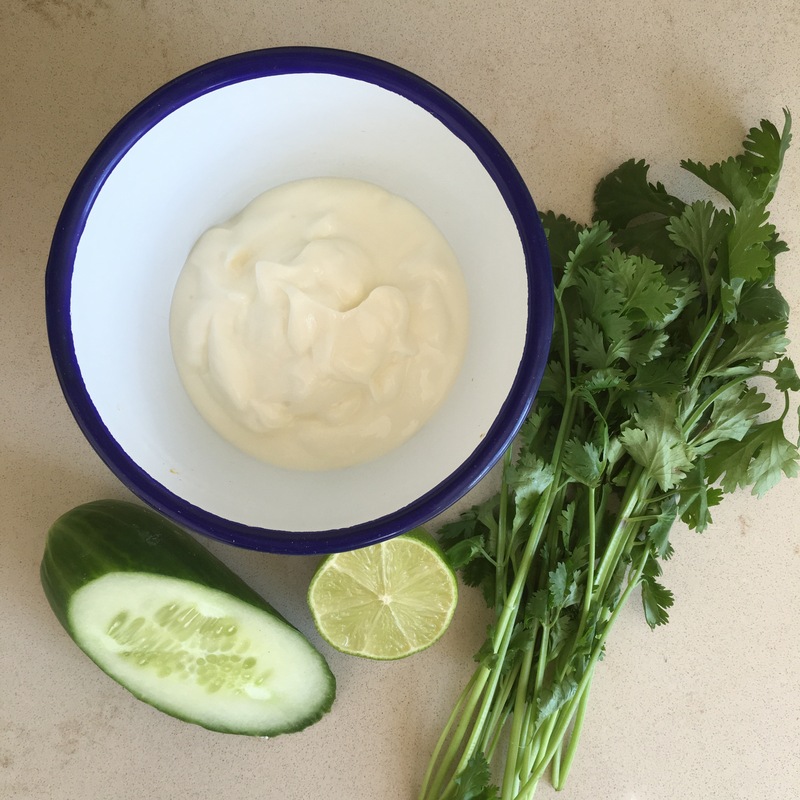 While the chicken cooks mix the yogurt, lime juice, cucumber and the chopped coriander with some salt and pepper. 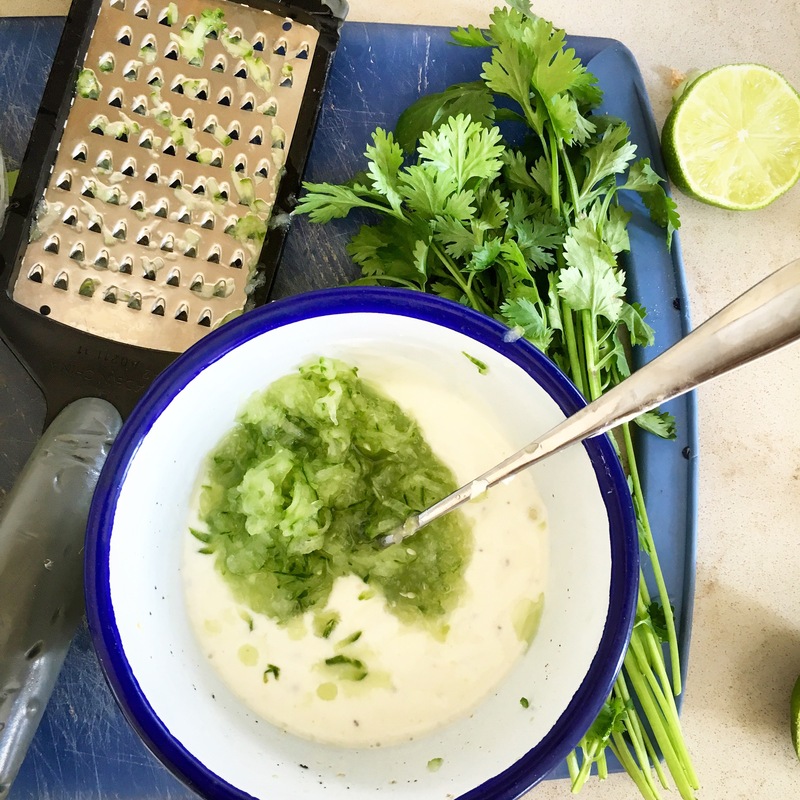 Serve scatters with the coriander leaves and sliced spring onions with the creamy raita on the side.